As a staple of the American office for over twenty years, email has become a surprisingly easy way of eating up hours of your workday or getting yourself fired from nothing more than a few all-caps sentences. Here are some of most common mistakes made over email and the fixes to make them all better. 1. You're writing too aggressively. A brisk email noting what needs to be done may appear to be the epitome of professional communication, but with a lack of nonverbal cues, many people blow negative aspects out of proportion. A study by industrial and organizational psychologist Erin Richard bolsters that point. Two hundred eighty-eight undergraduate students were asked to read an email and then listen to a voicemail containing the same somewhat negative statements such as being late with a deadline. The email was perceived more negatively. Fix: If you have something to complain about, do it face to face or over the phone so your recipient can hear your tone of voice, says Richard. 2. You're emailing at a bad time. 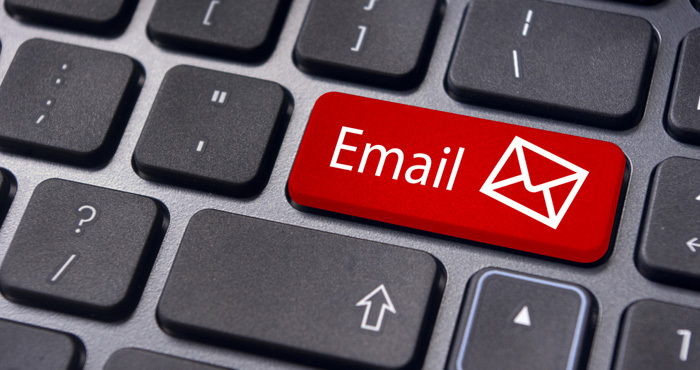 A survey of 500,000 marketing emails by email tracking software provider Yesware found that emails sent in the morning had the highest reply rate (45 percent), no matter what day of the working week it was. Fix: If you're sending an email whose response you're waiting on tenterhooks for, consider doing it first thing in the morning. Gmail users can download the Boomerang extension for Gmail. For other services, you can try Letter Me Later to schedule a specific send time. If you use Microsoft Outlook, you can set a favorable send time by selecting Delay Delivery in Options, then clicking Do Not Deliver. According to Richard, people tend to use any kind of cues in the email to make inferences about the email, including time stamp. 3. Your subject line is too impersonal. It's not hard to spot a spam email. Its subject line usually contains exclamation marks and your full name. But a Yesware study of 1,000 emails sent by sales professionals found that other subject-line words were also guilty of resulting in lower open rates. As for the length of a subject line, conventional wisdom says to keep it short and sweet, but the study found no distinguishing features between longer or shorter subject lines. Fix: If you're writing dozens of cold emails to potential clients, it’s worth testing out different combinations of keywords for your particular industry to track open and reply rates. According to this test of 1,000 cold emails run by journalist Shane Snow, there's no silver bullet for the perfect, one-size-fits-all subject line. Instead, personalizing emails was deemed the best strategy for getting meaningful replies. 4. You're being too formal. While erring on the side of formality is good bet in an initial email, studies have shown that “soft” statements that help you get to know the other person can significantly improve your chances of getting what you want. Emoticons like the smiley no longer carry the stigma of unprofessionalism. “In our research, we found that using a smiley in a business email increased readers' perception of the writer's friendliness, which cancelled out the effect of being perceived as less professional,” Richard says. 5. You’re being too subtle. When researcher and Ph.D. candidate in organizational behavior Andrew Brodsky asked employees of a media organization for emails they felt were written poorly, he found that while mimicking email styles can be effective, it could also leave room for misinterpretation. The intro of the commercial needs to be redone. I’m sure that’s the client’s doing and you will handle it . Warm Regards, [Manager’s Name]. Though seemingly inoffensive, the email was regarded as condescending and nasty by the employee based on her emotional interpretation of the situation. Fix: An NYU study found people are overconfident about how well they relay emotion over email. Instead, be specific, Richard says. “Use actual words to communicate how you're feeling rather than assuming they'll hear it in the tone, because the tone is what gets misconstrued,” she says. For example, in the above email, Brodsky suggested that writing “I am very happy with your work so far. I think the intro could be improved, though; would you mind giving it another shot?” could have left less room for the employee to misinterpret and inflate with her own insecurities. 6. You’re being too blunt. Framing requests in an email, particularly initial communications such as cold emails to potential new clients, can often be a complex construction of pleasantries structured around the request itself. One study by Richard examining the effect of cross-cultural expectations in business emails found that Chinese businesspeople were more likely to write messages in the framework of greeting followed by “facework” (such as niceties asking about a person's well-being), reasoning (the context of why they wanted the recipient to fulfill the request), the request itself and then an expression of gratitude – in that order. Conversely, American businesspeople were more likely to write emails that contained a greeting, followed by a direct requests softened simply by the use of phrases such as “Would you . . .” or “Could you . . .” followed by the reasoning and finally thanks. Receiving an email not phrased along an expected line of politeness resulted in greater irritation and a lower desire to do business with the sender. Similar results were found within individuals who had differing standards of business etiquette. Fix: Get friendly up front. “Based on our research, we found that using friendly statements at the beginning of an email and placing your reasoning before the request was perceived as more polite, and people had a greater desire to do business with the email's sender,” Richard says. 7. You’re spending too much time on email. Americans spend 7.4 hours per weekday reading and responding to email, 3.3 hours of which is personal. Last year, a separate study by technology market research firm Radicati found that workers receive an average of 121 emails a day. Many people respond to emails or may feel pressure to respond to emails as they arrive, yet the costs of multitasking have been shown to decrease efficiency and even IQ points, according to one University of London study. Fix: Get savvy about which emails need to be responded to or even read at all by enabling Google's tabbed inbox to auto-sort mass mail such as travel itineraries or promos, or download a mail organization add-on for other email services, like Unroll.me . If you use Gmail, an add-on called Inbox Pause can remove the distracting trigger of a new email by freezing the flow of incoming messages for a time period of your choosing. When you get around to dealing with it, take this simple mantra from Alphabet executive chairman Eric Schmidt: last in, first out. Deal with the most recent emails first. Older emails may contain outdated information or already have been dealt with.